Donna Serdula is working as System administrator at Universal Containers. They have enabled shared activities to manage their daily activities better and share their calendar with peers. Louis Brooks has assigned a case to Donna Serdula which states that events created by her are not visible to user Caroline Bell. Before going ahead with the solution, Let’s discuss what Shared activities are? Once you have them selected, the field Name will display one of the contacts names and then +5 if you have selected 6 contacts in total. You will now find the event on the activity history of all contacts you have selected. This also applies to Tasks and Emails, where you can select multiple contacts, and the task will be found on each of these contact’s activity history. 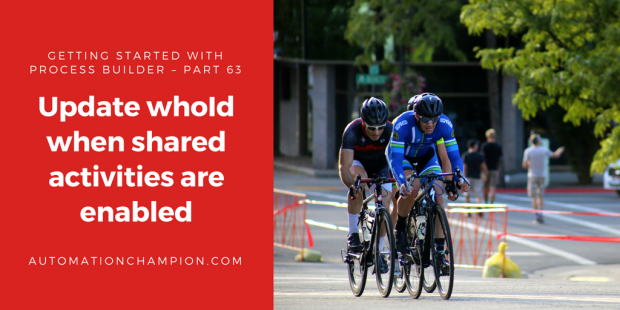 How do you enable Shared Activities? Once you are done, click on the Save. You can only select up to 50 contacts. You still can only select one lead, just like without shared activities enabled. You cannot mix leads and contacts. It’s either one lead or up to 50 contacts. To solve the above business requirement, we will update the Name (WhoId – to points a specific contact record) field. Before going ahead, I will suggest you to check Getting Started with Process Builder – Part 62 (Auto share events from a shared Calendar) article to get the context of what I’m talking about. Before going ahead with the solution, you have to understand EventRelation Object. It represents a person (a user, lead, or contact) or a resource (such as a conference room) invited to an event. 1. First of all, create a contact record with the name Contact to share events. 6. Save the Flow (Type: – Autolaunched Flow) with name Add contact to an event and close the canvas. Don’t forget to Activate the Flow. 6. Now that you have a schedule added to your process, next step is to add the Flows action to it. For this select action type Flow. Use Field Picker to choose the field [Event].Id, as shown in the following screenshot. Thanks for the information, very helpful. I can’t seem to get the Contact to be displayed in the “Name” field on the Event, however. It will only show in the “Hasn’t Responded” related list. Disregard my above comment! This works great! I was attempting to update the WhoId immediately rather than scheduling it to occur 0 Hours from now. Can a similar version of this be applied to automatically add specific users as invitees? Process Builder would be used to set the criteria. Good follow up to part 62.